Matching versatility, value, safety and security, the new Rondo is a decidedly attractive choice for anyone in a one-vehicle household. The top-line EX, particularly when upgraded with the optional Leather and Premium Packages, makes a very inviting daily driver. 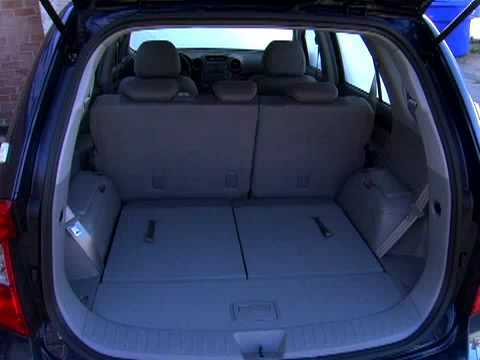 Comfortable and spacious small SUV with lots of cargo space. I have cervical issue, so with the heights of my Kia rondo it is very comfortable to get in and out of with out issues. It set up high enough but not to high. Not a lot of ground clearance sets close to ground. Can see clearly without blind spots. Easy to park. The back seats go down an fits nicely a futon mattress in back, which I have use to go camping in. Love the back under cargo spaces storage. Good gas miles. Good in the snow, with good tires. Love the middle console compartments for storage. And nice size glove box. Heated seats are very nice. Back seat fits my three grandchildren comfortable. Has a two position sun roof and ac. I bought used five years ago I have had to do brakes, calipers, front spring, oil pan replacement. Tires. Ride comfortable. It has been well maintained. In fact receipts of service are in the glove box. This vehicle has been a reliable one. I bought it from my sister before she passed. It is approaching 100, 000 miles but has been maintained well as far as oil changes and other requirements. The radio can be temperamental at times. Both rear windows malfunctioned over time and so do not go up & down anymore. I have used heavy tarp to protect it from the pets I have. I have hauled a lot of loads in the back and can even make more room by putting the back seats down. It is black in color with adjustable seats in length and back support. The headrests are also adjustable. Plus the driver's seat belt has an extender on it. It is a great family car that offers comfort to my extra passengers. My height is currently 5’ 11” and it is a perfect crossover for short people like myself. Unlike an SUV were you have to climb up and in, this crossover allows a person of my height to simply open the door and sit down. Although my car is older is has been reliable in rain and snowy conditions. The traction and braking system has not let me down yet. As with any older car I am experiencing some issues with the cars starter. Since I truly enjoy this car repairs and tune-ups are a definite as sadly Kia no longer makes this model car.